Eating meat contributes to Global warming, pollution, the destruction of forests, overuse of grain & fossil fuel, it wastes water and more. It is with this in mind that these food experts keep their food meat-free. They are saving the earth one meal at a time. Combine almond butter, maple syrup, water, lemon juice, ginger, salt/pepper in a small blender or food processor. Blend until creamy. Bring 4 cups water to boil. While water is boiling, prepare a small mixing bowl filled with ice water. Blanch wax beans in the boiling water (about 1 minute) then stop the cooking process by putting them in the ice water. Set aside. Tear kale into bite-size pieces with hands, place in large mixing bowl. Set aside. Dice peppers finely, and add to kale. 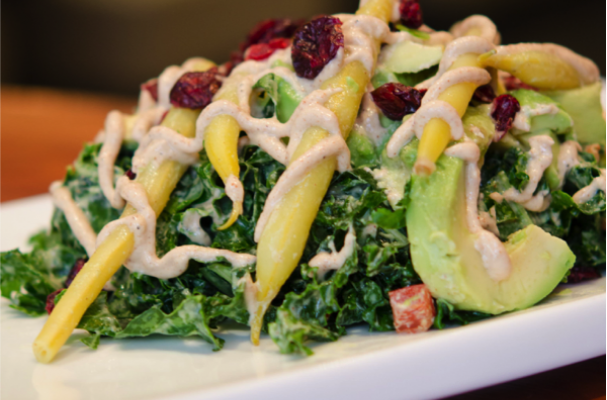 Plate the salad, and top with sliced avocado, cranberries, and wax beans. Top with an extra drizzle of dressing, and you’re all set! Dr. Mike Fenster says “for Earth Day, Be a Dahl and make this recipe.” The cardiologist who penned “The Fallacy of the Calorie: Myths, Misdirections and Machinations of The Modern Western Diet” has also hosted his share of cooking shows. He not only likes his recipes to be heart healthy, but also in tune with the earth. 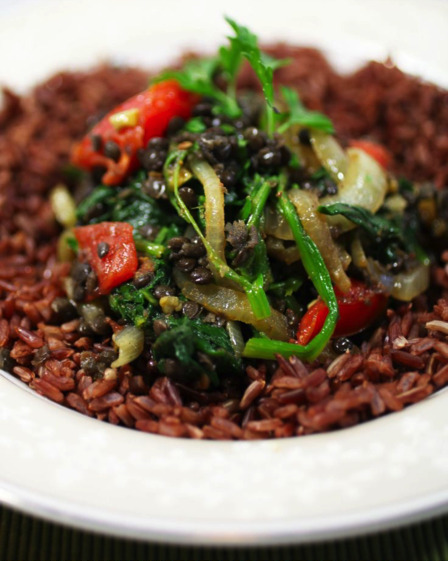 With lentils, tumeric, seasonal veggies and more this recipe sure fits the bill! In a medium saucepan over medium heat, bring the lentils (after rinsing) to a boil with the water, nage, turmeric and ginger. Reduce the heat to a simmer for 20 minutes, until the lentils are tender. Add the spinach, cilantro and vegetables and cook for another 8-10 minutes. In a small pan, heat the oil and add the garlic, shallot, cumin, mustard, coriander, curry and hot pepper. Cook over high heat for 2 minutes to release the flavors. Add this to the lentils, stir season with salt and pepper and serve with warm naan bread over rice. Is there any vegetable that seems more in tune with the earth than the beet? This recipe from the health-based cooking school Natural Epicurean Academy of the Culinary Arts in Austin, Texas is not only perfect for Earth Day, but also perfect for the still cold April nights. 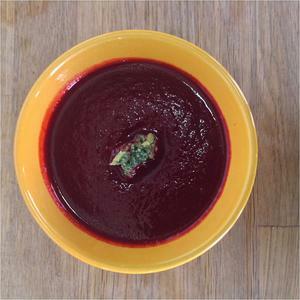 Place the beets, vegetable stock, salt, sugar, pepper, and oil into a 3 quart saucepan. Drop in Bouquet Garnis. Cover the pan and bring it to a simmer over medium heat. Remove soup from heat. Puree or mash beets to desired consistency. In between his many TV appearances, Chef Mark Bailey is a private Chef to the stars and everyone in between. He is often asked to make his menus full of veggies. 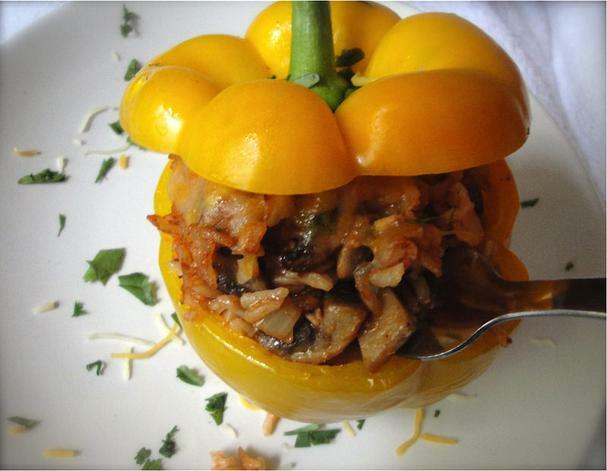 This mushroom stuffed pepper recipe is one he loves to make for clients on Earth Day. Bring large pot of water to boil over high heat. Add peppers to pot and boil for 4-5 minutes. Remove peppers from water and set aside. In a large skillet, heat 1 tbsp oil over medium-high heat. Add onions and garlic and sauté until ingredients become fragrant. Reduce heat to medium. Add additional tbsp of oil and mushrooms. Sauté for 8-10 minutes, stirring occasionally until mushrooms become tender. Stir in tomato sauce, rice and parsley. Season with cayenne pepper, salt and ground pepper to taste. Cook for 5 minutes. Remove from heat. Using a spoon, stuff each pepper with mushroom/rice mixture and stand upright in baking dish. Bake for 15-20 minutes.
. After several years of anchoring, hosting and reporting news/features, Chef Avila realized food was her real passion. She has starred in a couple Food Network series including “Chopped,“ been filmed cooking for “The Real Housewives of NYC,” and even won TLC’s reality show/cooking competition “Dinner Takes All.” She also starred in several episodes of her self-produced show, “Green Goddess” (part of which aired on NYC-TV). In addition, she has appeared on such outlets as Fox News, CBS, ABC, NBC and Better TV. She was also featured in “Pregnant in Heels” on Bravo. Over the last few years Cindi Avila has appeared on various shows around the country as a spokesperson for Lightlife (vegetarian food) and various other brands. She was also a featured speaker for three years in a row at the popular NYC Vegetarian Food Festival. In addition she served as a celebrity judge at the 2011 St. Croix Food Festival and for Bravo’s Top Chef Tour. Chef Avila has written for NBCNews.com, Today.com,FoxNews.com and more. Her recipes were also recently featured in The New Greengrocer Cookbook and she put together the Good Morning America cookbook for the iPad. Now owner of her own public relations firm Cindi is now focusing on helping other companies get the recognition they deserve!